There are a few promotions right now which can be stacked to get some pretty cheap clothes at The Gap. 2) Gap Cash - Spend $50 at Gap and earn $25 of Gap Cash, spend $100 at Gap and earn $50 in Gap Cash. You can spend more and earn more as well. $25 in Gap Cash can be redeemed against a future $50 Gap purchase. $50 in Gap Cash can then be redeemed against a future $100 Gap purchase. They expire quickly. 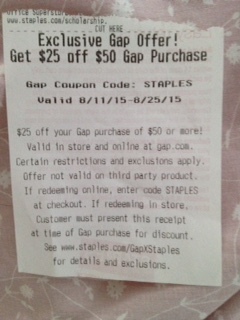 3) Spend $10 at Staples and you will earn a $25 coupon off a $50 purchase at the Gap. Offer will be issued until 8/22/2015 and valid until 8/25/2015. Or a purchase at Gap can earn a 20% off coupon good for school supplies at Staples (I wish iPads were school supplies!). Coupon can be issued until 8/22. Coupon will expire on the the 29th. Spend $10 at Staples and earn your $25 coupon. You can also just use Promo Code STAPLES for Gap online, though I imagine in store the sales associate will want to see your coupon. Spend $125 at Gap, use your $25 coupon. The price will drop down to $100. You will earn $50 in Gap Cash. Pay with your American Express card and the price drops down to $75 and you keep your $50 Gap Cash. Earn your coupon to be used at Staples. Spend $85 and earn $50 of Gap Cash and coupon at Staples. Spend $100 and use your $25 coupon, your final price will be $50 but you will only earn $25 in Gap Cash. Spend $60 and earn $25 of Gap Cash and coupon for Staples. Buy $100 of clothes at the Gap. $25 from AmEx. Earn $50 in Gap Cash and coupon from the Gap to use at Staples. Spend $75 and earn $50 of Gap Cash and coupon for Staples.